Manhattan's grid may be "the greatest" one but there are many precedents. The Law of the Indies, Philadelphia, Savannah, Albany, the Public Land Survey of the U.S., Christopher Wren's post-fire plan of London, Edinburgh, and Washington, D.C. are described in The Greatest Grid, a book (and exhibition of the same name) about the city's master plan of 1811 edited (and co-curated) by Hilary Ballon. Charles V developed the Law of the Indies which was used to design Spanish colonial cities. The grid of square blocks "400 feet per side arranged thirteen blocks by nine blocks with 40-foot wide street" was centered on an undeveloped square (p. 49). Similar to the Law of the Indies, the Public Land Survey System of the U.S., proposed by Thomas Jefferson, developed in divided the country northwest of the Ohio River into six-mile square townships and every other township was divided into 36 one-square mile lots or sections. 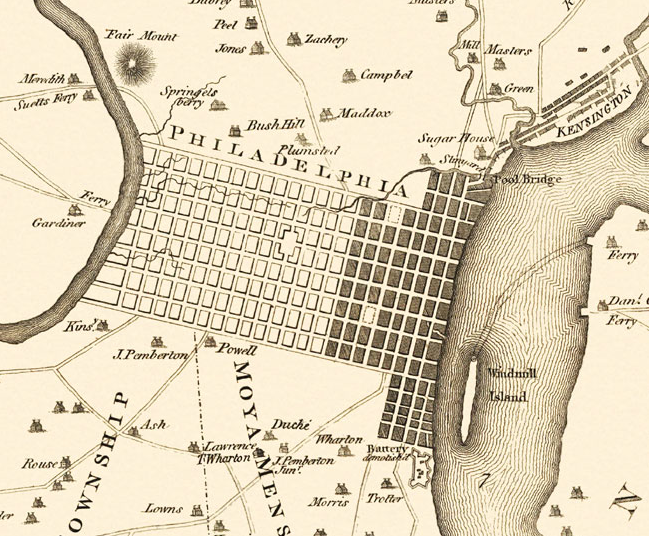 William Penn's 1683 plan for Philadelphia or "green country town" included four squares, now parks, one in each of the city's quadrants as well as a "great civic square." Philadelphia's original 400-foot blocks were subdivided to accommodate people's preference for narrow row-houses and to eliminate large, mid-block open spaces. Savannah's squares are one of the things I like about that city. 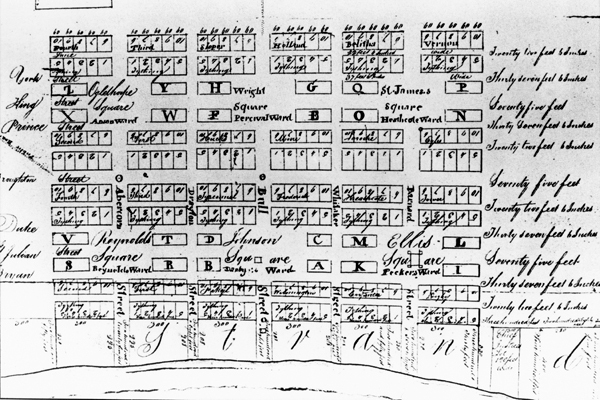 General James Oglethorpe's plan of Savannah (1770) was a ward system of six squares. The design accommodated expansion several times and there are now a total of 24 squares. Six squares were added in the 1790s and 12 were added between 1801 and 1851. 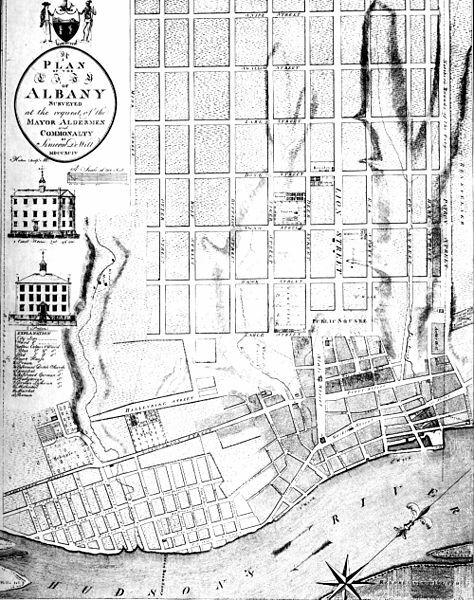 Albany's original blocks, at 400 by 700 feet, were larger than the ones in Philadelphia. However, they were also divided to create smaller blocks of 200 by 700 feet, similar in size to Manhattan's blocks which are approximately 200 by 800 feet. An interesting aspect of Albany's original streets is that they were named for birds or for animals. All but one of the bird-named streets retain its name while only one animal-named street retains its name. The streets were named by the plan's designer Simeon De Witt. 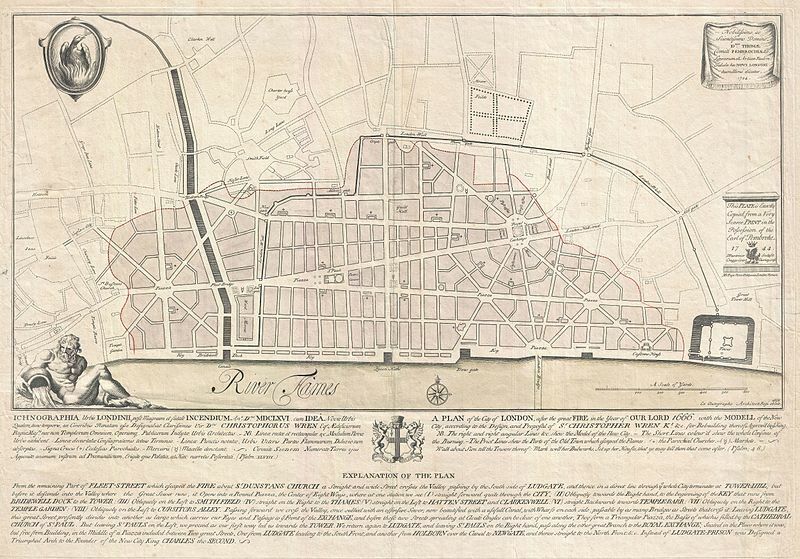 Christopher Wren's grid plan for reconstruction after the Great Fire of London 1666 was not implemented because, as Carolyn Yerkes argues, it would have displaced "all its residents and forcing them to sell their lots" (p. 53). Edinburgh had more success adding a grid to its original city -- of course the circumstances were very different. The city planners commissioned a "New Town" to retain the city's wealthy residents. 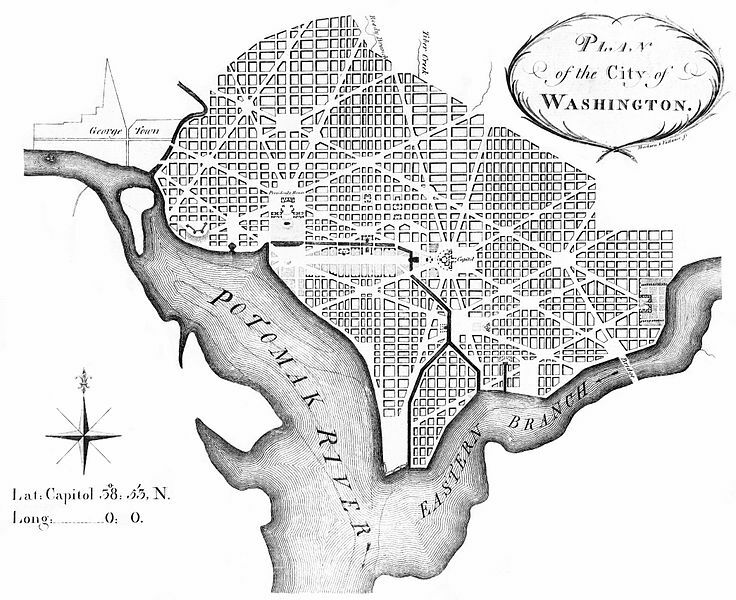 Finally, there is L'Enfant's 1791 orthogonal grid-diagonal street plan for Washington, D.C. 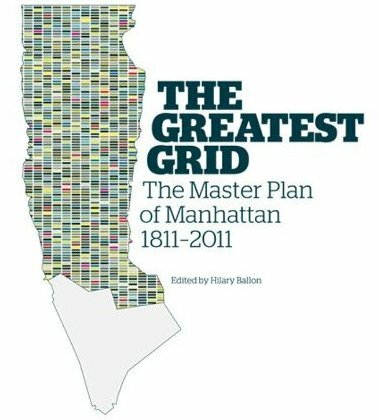 The plan for D.C. is monumental: "the intesection of the two grids...create[d] opportunities" to build monuments (p. 55) which Hilary Ballon contrasts with the Manhattan grid's. She argues that "individual structures were submerged in the overall unity of street and block" (p. 55). Of course, elsewhere in The Greatest Grid, it is pointed out that the grid's intersections with Broadway created these kinds of monumental opportunities (example: the Flatiron Building at Madison Square Park). Too, the emergence of skyscraper construction created Manhattan's iconic skyline. P.S. Spacing Toronto's Dylan Reid considers if a grid is the most efficient street layout after attending a talk given by Yale Law School professor Robert Ellickson about his paper titled "The Law and Economics of Street Layouts: How a Grid Pattern Benefits a Downtown." With the exception of Albany, I have been to all the cities you mentioned. I must say Savannah's is the most human.